100% Toyokalon Fiber by Janet Collection. Shorter version of our popular String Bobbie (medium). *Picture shown is String Bobbie Medium length. 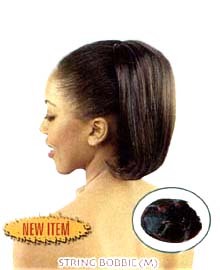 String Bobbie Short is approximately 2" shorter than Medium length with one comb. It is not reversible for flip look.